Cool, refreshing, and perfect for a summer day! This cup full of happiness can easily be adapted to suit your favorite fruit taste. Raspberries, strawberries, or any other fruit with different flavors of yogurt make this decadent dessert even more desirable! - 1 cup Lite Cool Whip, plus 2 Tbs for the topping of each dessert bowl. In a large bowl, combine pudding and milk. Whisk for about two minutes until the pudding starts to get firm. 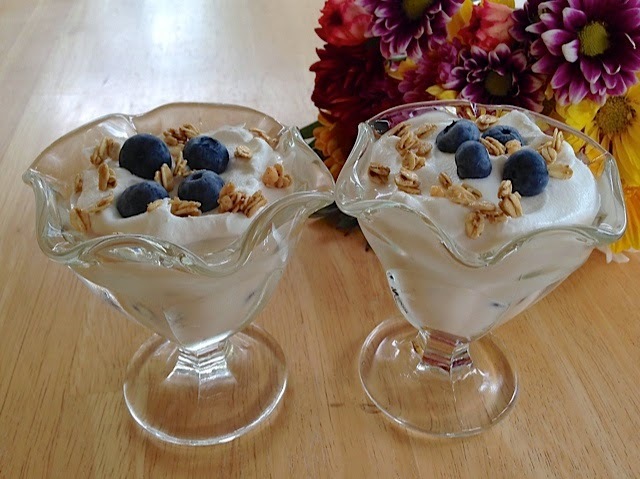 Add yogurts, fresh blueberries, and cool whip. Spoon 1/2 cup into little dessert bowls or ramekins. Sprinkle with just a little bit of granola and enjoy! Refrigerate for a few hours beforehand if you prefer it chilled. If you'd like a printer-friendly version of this recipe, Click Here.